The current e-newsletter from thequest, pastored in Columbus, Ohio, by Mike Jentes, carries more information about a new church-plant in that state’s capital city. Our vision is to be like an oak tree that is physically rooted in our city and spiritually rooted in God’s Word. Capital City Grace has been the vision of Larry and Sylvia Totzke for quite some time. Larry and Sylvia moved to the Short North district of urban Columbus over seven years ago as part of the team from East Side GBC that founded the quest. The Totzkes believe God wants to use them to plant this church to reach the downtown neighborhoods. God has also called Eric and Julie Miller (pictured) to be on the team to begin this work. They moved to Columbus in February after talking about living in Columbus since before getting married almost two years ago. They spent the first year of their marriage praying and waiting for the right ministry opportunity, always listing Columbus as their first choice. 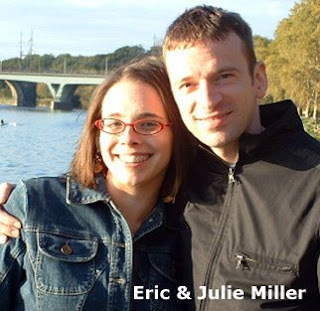 Both Eric and Julie had lived in larger cities and were craving a return to life and ministry in the city. If you want to stay connected via email to all the plans, you can find contact info on the website at www.capitalcitygrace.com (the website is being constructed even now, so look for a new launch soon! ).